Set-Up "Sunrise" waterproof boots; I believe it's the 2006 model. 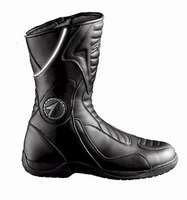 Made by Italian bootmaker Sidi. Looks like they'd be good for touring, sport-touring and commuting. NewEnough is closing them out for $89! I searched the 'Net and most other vendors are asking $129 for the same boot. Clicky here to go directly to this sale.